Sue is the Sole Proprietor of Nature’s Brilliance By Sue. It is located on the East Coast in a small town in New Jersey. It was formed to help people locate products for their skin tone & skin type. Sue has dealt with multiple allergies for years and through persistance and exhaustive research has found a line of natural mineral make-up and organic skin and body care products suitable for all skin types, even those with multiple allergies. Nature’s Brilliance By Sue will not sell any product that is not 100% Natural or Organic and has not been tested by the owner her self. The Pomegrenate Cream Lipgloss comes in this round screw pot which is very rare for a lipsgloss.The shade that I got was Coral Reef.Its a very Pink Red toned color.Its kind of matte on the lips and not very glossy.Its staying power is quite good i.e around 4 hours and I didnt had to re apply it once I wore it.The texture on the lips is very soft and moisturising. 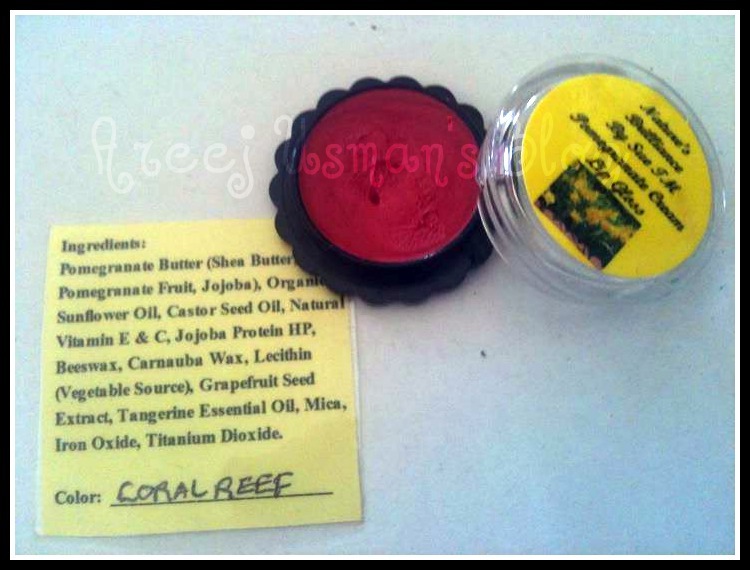 Pomegranate Butter (Pomegranate Fruit, Shea Butter, Jojoba Oil), Castor Seed Oil, Beeswax, Carnauba Wax, Glycerin (Veg. ), Lecithin (Veg. ), Jojoba Protein HP, Organic Sunflower Seed Oil, Natural Vitamin E and Vitamin C, Grapefruit Seed Extract, Mica and Iron Oxide. 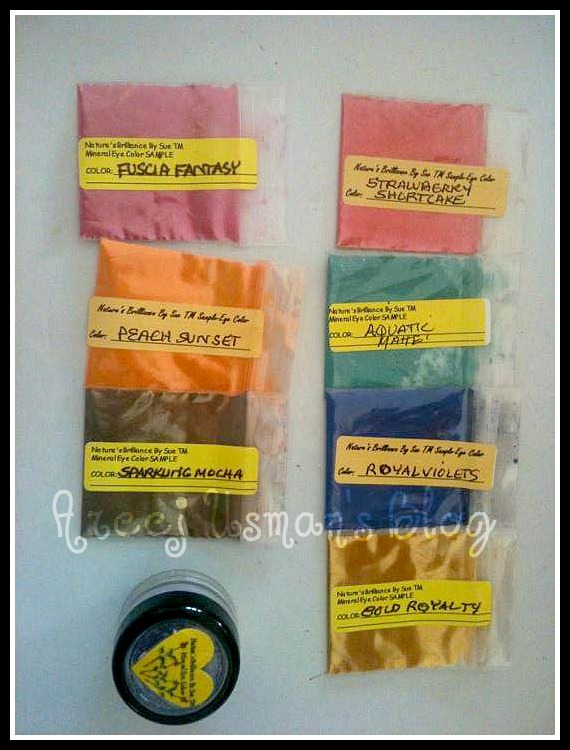 These are loose powdered mineral eye shades.Some of them are matte whereas most of them are in the satin shimmer finish that looks beautiful for night time looks. 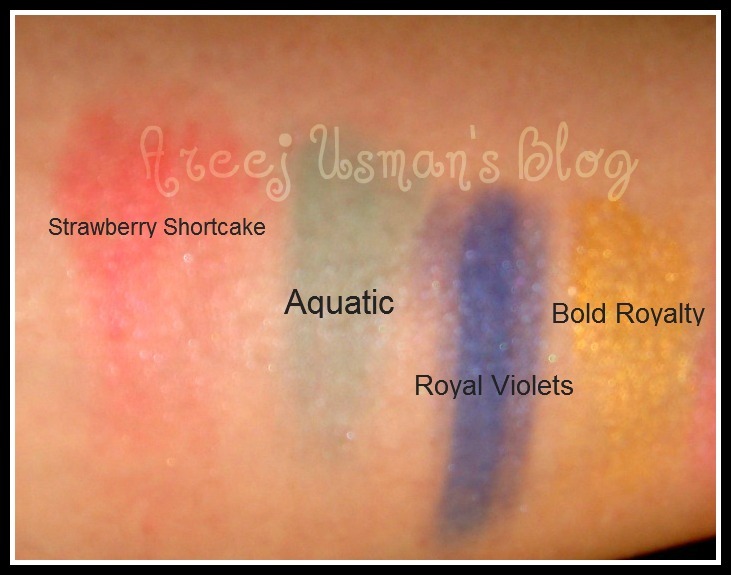 Here are the swatched versions.They are single swatched applied on an eye shadow base to enhance their pay off and lasting power. 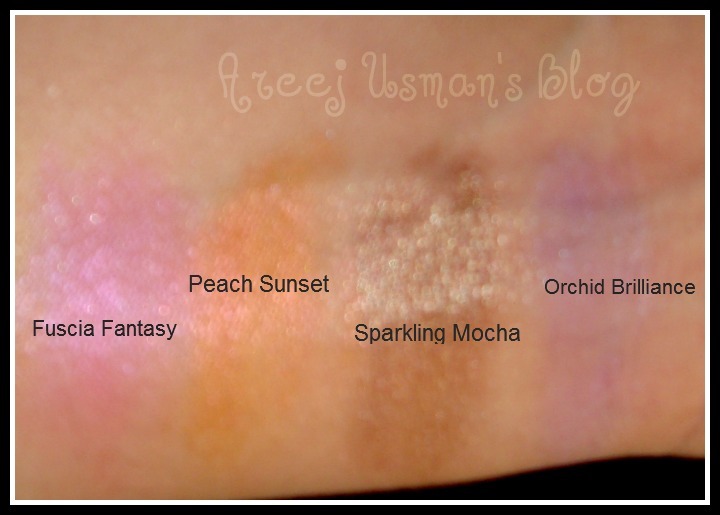 Most of the shimmery shades are very well pigmented.I love how the colors Gold Royalty and Sparkling Mocha turned out on the skin.The staying power of these shades is around 4-6 hours if using an eye shadow base.I mostly like the shimmer shades in these compared to the two matte ones i.e Orchid Brilliance and Aquatic. Ingredients: Mica, Iron Oxide, Titanium Dioxide. Matte shades also contain Serecite. I would definitely recommend you to try a couple of their products.Compared to the quantity of product that we are offered the prices are relatively less.The products are all natural so there can be no infection or skin allergies.You can also check out the shower gels , solid perfumes, lip balms, shampoos, body lotions, soaps, sunscreens, body sprays to mineral makeup like foundation, concealer, eye shadows, lip colors and lip glosses etc.While checking out provide the code “AREEJU10” to avail a 10% discount. 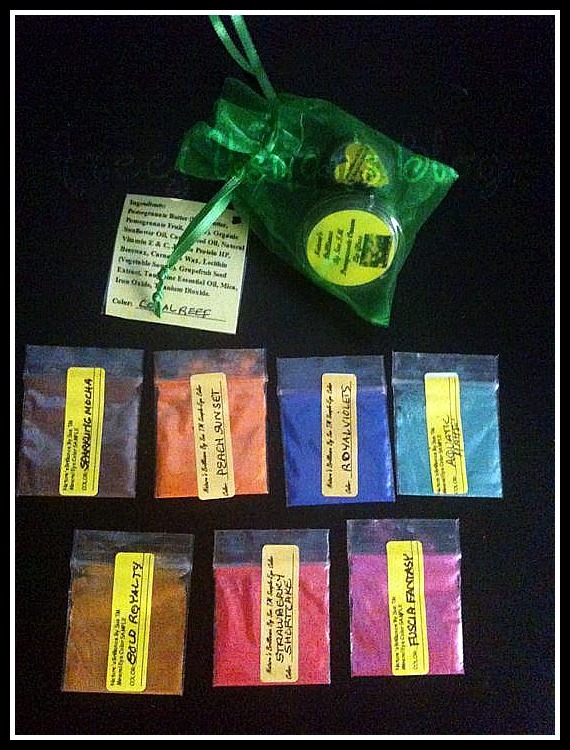 For more details check out Nature’s Brilliance by Sue.You can also find them on Facebook. How It feels Like to be a SLEEK LUCKY 56 WINNER! I really like the gloss!